Huntsville, AL. 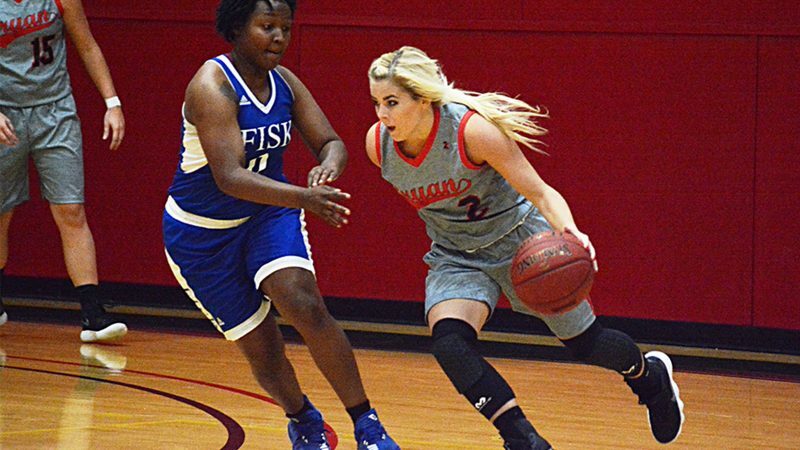 – A 15-of-31 performance from the perimeter by the Bryan College Women’s Basketball team Tuesday night was a program best for the Lions as they convincingly shut down the Ambassadors of Oakwood University 95-43 to improve to 2-0 on the season. The previous team single-game three-point record to beat was 14. Freshman guard Karli Combs led the attack as she broke free for 30 points, which included making 6-of-9 from long range and a perfect 4-of-4 at the foul line. She was trailed by Amber Levi’s 19 points on 8-of-13 shooting from the floor, while she was 3-of-6 from the three-point line. Another freshman guard, Sarah Cain, had herself a night connecting on 4-of-8 from behind the arc and 2-of-2 on free throws for 16 points. Deandra Luna and Emmy Allen followed with seven points apiece as they each tallied one three-pointer, helping the Lions set the new record. Tristan McClellan and Marlee Sells helped with six points, respectively, while Leann Scharberg chipped in two points and both Trinity Fisher and Keneisha Love added one point apiece. Luna currently ranks 2nd in total assists in the Appalachian Athletic Conference with 16, only behind Bluefield College’s (Va.) Danae Cox who has played three games, which is one more than Luna. She dished out a team-high seven assists at Oakwood, while McClellan aided with two. Allison led in the rebounds column for Bryan, grabbing seven rebounds on the defensive end. Levi and Sells each finished the game with five boards apiece. Even though Allison had a quiet outing on offense, she helped in other areas in addition to rebounding as she swiped a team-best four steals. The major factors of the Lion’s overwhelming success was their 47.4 shooting in the game, 48.4 percent finish from three-point land, 80 percent completion at the foul line, 33 total rebounds, and 15 steals. Bryan jumped out to an early lead and never looked back, outscoring Oakwood in all four quarters. The Lions offense caught fire and couldn’t be stopped, as 10 of their players were able to add to their score. Bryan helped keep the Ambassadors without a win as they dropped to 0-7 overall. Bryan will wrap up their road play this weekend as they participate in the Union College Classic, hosted by fellow conference rival Union College (Ky.). The Lions open the event on Friday, Nov. 10 with a showdown against River States Conference school, University of Rio Grande (Ohio) at 6pm. On Saturday, the Lions get to take on another RSC opponent, Ohio Christian University, with tipoff scheduled for 3pm.